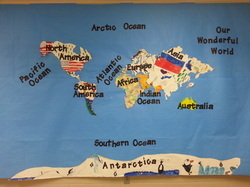 In social studies we learn about maps and globes, immigration,landforms and water terms. Maps and Landforms Children are fascinated by their world. In third grade we use that natural curiosity to teach them how to make and use maps, what landforms and water terms are and where they can be found and the names and locations of the 7 continents and 5 oceans of our planet. Our largest unit in social studies is the study of immigration with a focus on Ellis Island. We also learn a lot about our own family heritage. The culminating activity is an immigration day where the children pretend they are immigrants coming to America in the year 1800.